Ballyclare Comrades Reserves’ slip-up against Magherafelt Sky Blues Reserves allowed Antrim Rovers to replace them at the Ballymena Junior League Division 1 summit. With regulars Jonah Nicholl, David McAllister, Anthony Hill and Ross Davidson missing from the defence, Stephen Hughes’ lads were a pale shadow of themselves, and despite a second-half recovery they went down 2-1 at Threemilewater Park against one of their main rivals for the title. Chris Crowe almost got the Reds off to a flyer, but his first minute effort shaved the upright, and that was their best scoring chance in the first-half. In the 13th minute the Blues opened the scoring when a deflected shot looped over teenage keeper Zak Cooper, who later came to the rescue when he brilliantly saved a penalty at the base of the post following a foul by Forsythe. The Blues continued to impress, and eventually doubled their lead in the 40th minute when Cooper was left exposed. Ryan McIlwaine retired injured at half-time, but his replacement, Scott McKenzie, from the Under-19s, had an impressive debut at right-back, with skipper CJ McIlwaine switching to the heart of the defence. In the second-half the Reds were competing better, with Jamie McTaggart and Mark Conn going close, before Rhys Clelland reduced the deficit with a low shot in the 70th minute, after linking with McIlwaine. 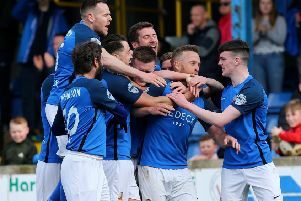 The Blues were on the back foot in the final quarter, and only a goal-line clearance prevented Craig Todd from equalising, while another Conn effort ended in the side-netting with the keeper again beaten. In the 90th minute the ‘Wee Reds thought Todd had salvaged a point, when the talented midfielder neatly chipped the keeper, but the ball struck the underside of the bar, and the referee ignored claims that it had crossed the line. “The match was won and lost in the first half,” said manager, Hughes. “The lads showed great determination in the second half, but the damage had already been done. “This second defeat cost us the league lead, but when we are at full strength we are more than a match for anyone. Ballyclare Comrades Reserves: Cooper; CJ McIlwaine, Davidson, Forsythe, Thompson; Crowe, R Mc|McIlwaine, Todd, McTaggart; Clelland, Conn. Sub: McKenzie. On Saturday the Reserves travel to UUJ for a Canada Trophy clash with FC Whiteabbey.